Today we have Genesis P-Orridge in our celebrity corner. An English performer, musician, writer and artist, P-Orridge is a founder of the music group Psychic TV, and that was what he had meant to tattoo in Hebrew on his arm. "Psychic TV" that is. As you can see, this tattoo is a brave attempt, but it doesn't quite work as intended. It roughly says "Psekakh Tav" Psekakh is just gibberish, though Tav actually has a meaning in Hebrew, it means "note". 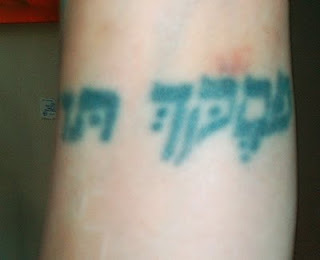 Yep, if Psychic TV is your favorite band, now you know how to write its name for your very own Hebrew tattoo! Wouldn't that be better rendered טלוויזיה פסיכית? Haha, it's Psychic (supernatural powers) not psycho (crazy). I think transcribing it makes more sense, especially since translation will make the name of this band practically unrecognizable. Gen thought the first word meant something different or special though I forget what. I can ask him. with a slightly different nikud, the first word can be "Piskecha", which would translate (barely) into "your judgement", which would change the whole thing into "your judgement note". It's obviously a terrrible tattoo ("Fsekkikh Tv..?" - with dagesh - hirik confustion to boot), but I must completely disagree with your transliteration. The two yuds make it look like Yiddish, there's no reason for the dots between ti and vi, and a case can be made for retaining the peh, ie, it makes it look much more like "psychic." If Lincoln can retain it's lamed (even to the point where the language forces one to pronounce it), why can't psychic retain it's peh? @Fred: Simple. The group Psychic TV isn't totally obscure in Israel, and its name is most commonly transliterated the way I wrote it, dots and all. will be "your judgment is a note".